I have just been checking out rankings and stuff this morning after a nice long Christmas break and I saw a Google ad for BT SearchSmart: PPC & SEO. I checked it out and it is the real British Telecom offering SEO and PPC services, you can check the website out here. 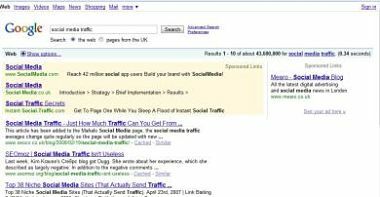 BT are probably the biggest company ever to start selling SEO and PPC services. That doesn’t sound too bad, it could go either way I guess depending on the quality of the articles they are creating and the quality of the web directories and article directories they are submitting to. For a similar price we will include submissions to all of the best paid directories such as BOTW and Yahoo etc. If they are just submitting to the free ones then there is less chance of your links getting approved and sticking around. About two weeks ago I got a trackback or something and found this site called the WAHH Marketer’s Blog linking to me, I checked out the page and the reason it had linked to me was because of Zemanta, a content enhancement tool for bloggers. “Simple point & click enrichment of your blog posts (and emails). In real-time, while you type. We suggest tags, links, photos, and related articles. You save time and aspirin. So the reason I got a free dofollow link on a relevant page is because my Altavista.com article was picked up by the Zemanta system and recognised as a relevant page. How awesome is that, I haven’t paid Zemanta any money or even registered with them and they are hooking me up with free dofollow backlinks on good quality relevant blogs. So to the guys at Zemanta thanks very much for making an awesome product, I bet it is great for bloggers who use it as well, the ones that linked me just got a decent link out of it didn’t they? I reckon other bloggers will as well. Update: I have just found out that the 3rd blog post I linked to was actually copied from Mashable, I probably should have checked before I linked to it, I remember thinking it was a decent post because it mentioned 4 of the celebrities who I follow and I don’t follow many. 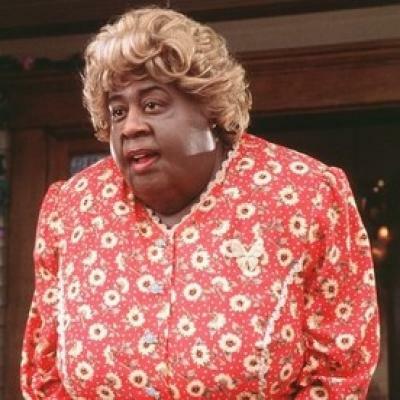 I have just placed a nofollow link to that post. I’m not complaining or anything it’s still a free link, but I won’t link out properly to copied content. 1. It shows more results then any other link checking tool (not including Google webmaster tools, but you can’t check competitors with that) – You can see a maximum of 1,000 separate domains linking to a URL or domain. 2. It only ever shows 2 results from one domain so the results you get don’t get swamped with a couple of site wide links. 3. If your IP address is based in the UK the results show the links with the most juice on Yahoo UK at the top so you can find out which links are helping you most on Yahoo. From the testing that I have done I have seen that generally Yahoo rates the same UK sites Google does – the links that rank high on Altavista’s link command will be from sites with good PageRank. So there you have it, if you like checking on who’s linking to your site or blog go to Altavista.com and give it a shot. You can check how many links a page has by searching for link: and then the page URL and you can check how many links a domain has by typing in linkdomain: and then the domain you want to check without the www. Just like on Yahoo site explorer but better. I remember about 3 years ago when you could actually use the allinanchor search command on Google as an SEO tool. The allinanchor command basically shows you the search results according to links only, so content is not a factor. 3 years ago you could do a regular search and then do an allinanchor and work out things like this website isn’t ranking as high as it should do because it hasn’t got enough anchor text links or it hasn’t got the right keywords in the content. Unfortunately at sometime around February 2006 the command seemed to stop working. Now I don’t believe Google actually disabled the tool, because if they did I think it just wouldn’t do anything. Allinanchor searches on Google will still bring up results, it is just the vast majority of the time they are no different to the regular results. I believe the command stopped working because the algorithm changed, on page factors are no where near as important as they used to be and lets face it most of the time when people get a lot of links on something they are optimised on page for it. So what can you use the allinanchor search command for? OK so here it is, the allinanchor command is a Google Sandbox detection tool. If you want to get a rough estimate of where a sandboxed site should be ranking according to the links it has then use the allinanchor command. I believe that the position result is roughly where the site would be ranking according to the links it has if it were not in the sandbox. With a little testing I think you could make a pretty good Google sandbox detection tool by using this command. If any of you know anyone who could make something like this up for me I might be willing to pay to try it out. The introduction of mapping applications such as Google Maps (undoubtedly the most popular example of all) and their subsequent widespread use around the world has resulted in an enormous amount of people taking up an interest in an interactive view of the world which previously was very difficult to obtain. There are millions of incredibly interesting sights to experience which, when living at ground level as we do, are rarely seen in the flesh. As an example, here are some intriguingly shaped communities which take on a new appearance when viewed from the air, along with those same areas pinpointed in embedded maps. Take a look around. 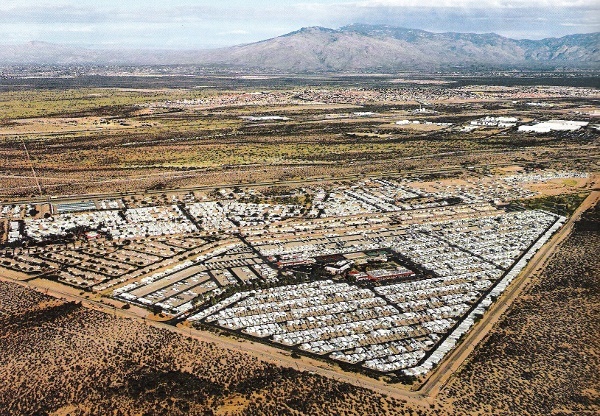 View Larger Map(Above) To begin, here’s a small mobile home community called Trails West just outside Tuscon, Arizona. The interesting thing about it is the shape as there aren’t many towns or communities with such a distinctly triangular boundary. 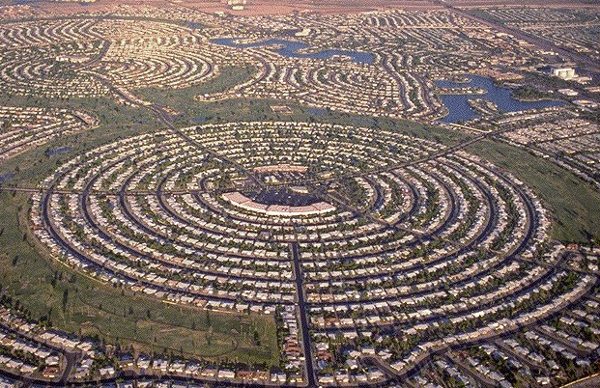 (Above) Sun City is a planned retirement community in Arizona which, due to its design and hundreds of identical houses, offers an incredible view on Google Maps. Dozens of tightly knit roads snake around the area and a even form a couple of huge circular neighbourhoods. 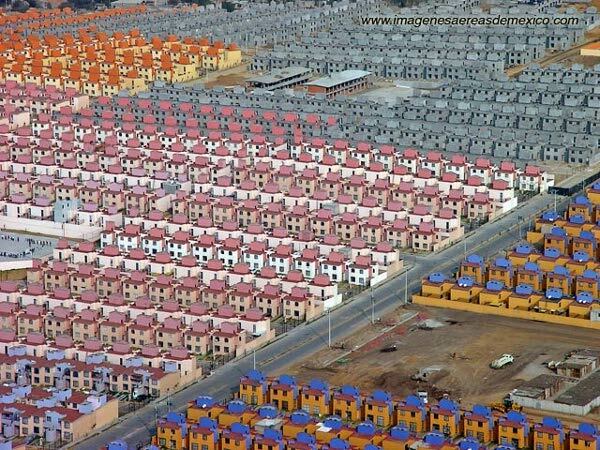 View Larger Map(Above) The town of Ixtapaluca in Mexico is full of low-income housing identical to the examples you see in the photo above, resulting in rows and rows of cookie-cutter homes which resemble a cartoon-based community. From above, the area is just as uniform and equally as fascinating. 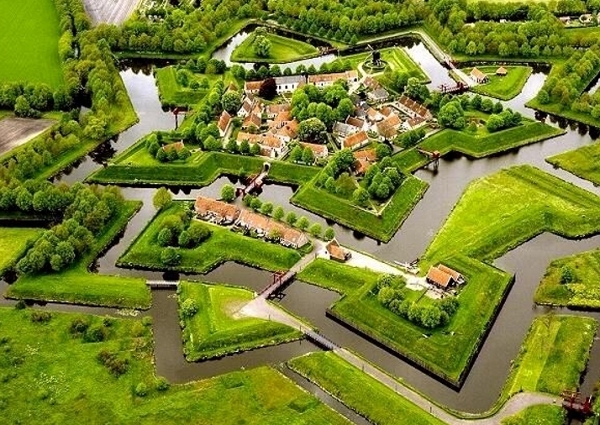 View Larger Map(Above) The beautiful star-shaped village of Bourtange was originally built as a fort in the 1500s, the shape chosen due to its highly effective defensive qualities. Today it houses a village and museum and looks incredibly unique, especially when viewed from the air. There are a few other similarly shaped villages around the world but none as defined as this one. 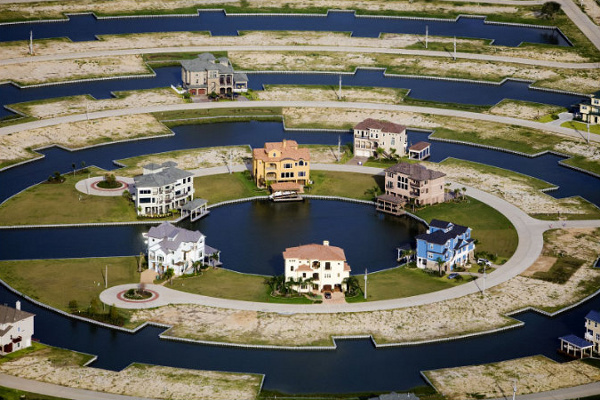 (Above) Developers in Galveston decided to build a planned community on the wetlands in Galveston and came up with a strange design where houses sit on rings of land which, from above, resemble concentric ripples on the water. At the moment the town is still under development, hence the numerous gaps where homes should stand. 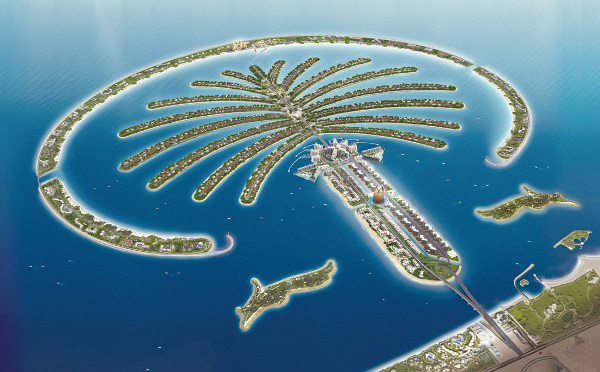 View Larger Map(Above) The award for Most Eccentrically Shaped Community has to go to Palm Islands in Dubai, an incredibly ambitious project which will, if ever completed following the financial crisis, consist of 3 separate palm tree shaped islands off the coast. Work on the first island began in 2001 and can be seen on Google Maps. The size and scale of the project is astounding.